For the Liberal Arts Foundation program, it fulfills both the HB (social science) requirement and the WA (first-year writing) requirement. For the new Liberal Arts Inquiry program, it fulfills the SS (social scientific practice) and the APW (analyzing perspectives and worldviews) requirements. It also counts as an elective for the Sociology and Anthropology major and for the Religion major. It welcomes everyone, at whatever level they wish to learn. The course has no prerequisites, other than a willingness to learn about religion’s role in contemporary society. Please explore our website. Read the students’ blog posts. See what they uncover as the semester unfolds. Religion is a key part of every society on earth. From the Stone Age to the Space Age, religion has given people a sense of themselves and of their cosmos. It has held societies together and has torn them apart. It is both a source of meaning and a source of confusion, both to individuals and to groups. We will spend the first part of the semester getting an overview of how sociologists approach religion. Then we will look in depth at some contemporary American religious groups. In the process, we will discover some useful tools for understanding religions as social organizations and for understanding religious dynamics. Each student will visit a religious congregation, observing and reporting on its practices. We will then explore some key questions about what is happening to religion in contemporary society. Is it disappearing? Becoming more conservative? More individualized? How does religion affect personal life? How does it shape society? Simultaneously, students will visit a second congregation and will a religious specialist, reporting their results to the class. Students will also each explore religion’s role in a contemporary social issue, writing a short report on a topic such as religion’s role in contemporary politics, religion and science, religion and the environment, etc. In these inquiries, we will use the sociological tools that we have learned to understand local religious life. By the end of the course, students will know a good deal religion as it is practiced in the real world. They will also know a good deal more about sociology! 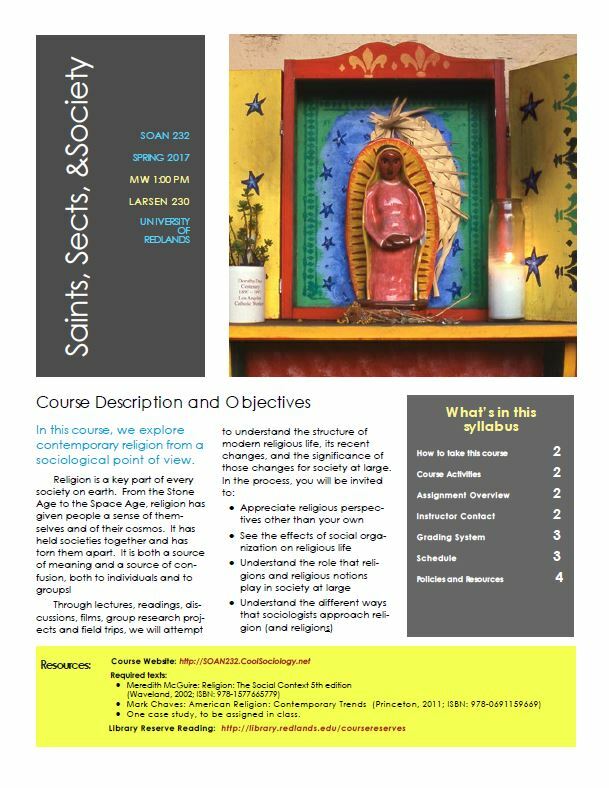 This site contains information about the University of Redlands course: "Saints, Sects, and Society", led by Professor Jim Spickard. This General Education course explores the role that religion plays in contemporary American society -- and what is happening to that role as our society changes. Please explore our site to see what and how we are learning. Please also visit our course blog. Each week, students post at last two substantive, thoughtful, and public comments. One is based on what we have learned in class. The other summarizes an article from the news about contemporary religion.